If you're more than just a casual consumer of movies, then the Letterboxd website will be right up your cinematic alley. On its simplest level, Letterboxd is a way of keeping track of what films you've watch, when you saw them...even how many stars out of five you'd give it. However, it's more than just an online movie diary. You can add detailed reviews, build up a watchlist of films you'd like to see in the future - and also interact (and banter) with Letterboxd's growing online community. The statistics are impressive - last year, over 300,000 reviews were logged on the site. You can also - enjoyably - create lists of films. using any kind of criteria you want. For example: I'm building on Letterboxd a list of my all-time favourite movies. As I put it on the site, they're "the kind of film that if I stumble upon it playing on some TV channel, I'll happily watch it right to the end - no matter where it is in the running time". Then there's my list of films I find mystifyingly overrated. With another, it's sequels that I find better than the original. 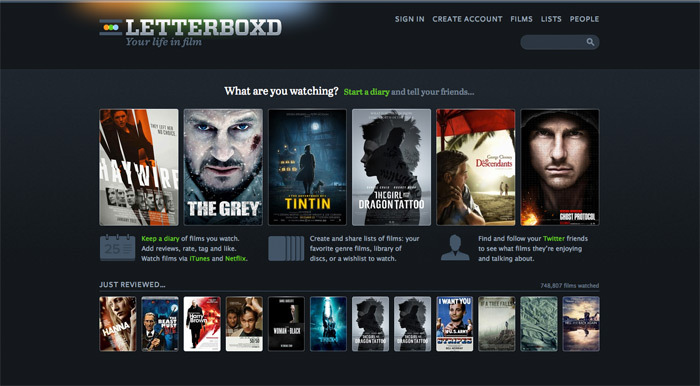 Best of all - Letterboxd is free to sign up and use. Unlike other "free" services, there are no limits - not to the number of films, reviews, ratings or lists you add. For the serious user, there is a chargeable Pro option, which gives you the ability to import lists from IMDB or your own spreadsheets. And if you're feeling particularly generous, you can upgrade to Patron level and donate some extra "thank you" money to the development team behind it. If you're a film buff, Letterboxd is definitely worth investigating. And if you'd like to follow me, I'm under Philip_Guest.